Thanks to my first four guests for this show in February 2010: Tanya Barfield, Professor Mary Frances Berry, Professor Nikhil Pal Singh, and Dr. Warren Maye. Please join me this month as I interview the following authors about their works: March 4th: Professor Elizabeth Nunez about her latest novel Anna In-Between, March 11th: Professor Daniel Black about his new novel Perfect Peace, March 18th: Professor Alan Singer about his book New York and Slavery, March 25th: Donna McDaniel about her book co-authored with Vanessa Julye, Fit For Freedom, Not For Friendship (tentative), and April 1st: Professor Bettye Collier-Thomas about her book Jesus, Jobs and Justice. 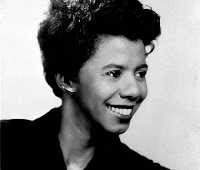 Photo of Lorraine Hansberry courtesy of Bettman/CORBIS.